There’s no quiet on the set when over-the-hill screen star Lawrence Tucker brings his naughty terrier, Jellybean, on location to the beachside town of Albatross, California. When Jellybean develops a rapport with Tucker’s violin tutor, the painfully shy, socially awkward Misty Agnelli, her arm is twisted into minding the mischievous animal. 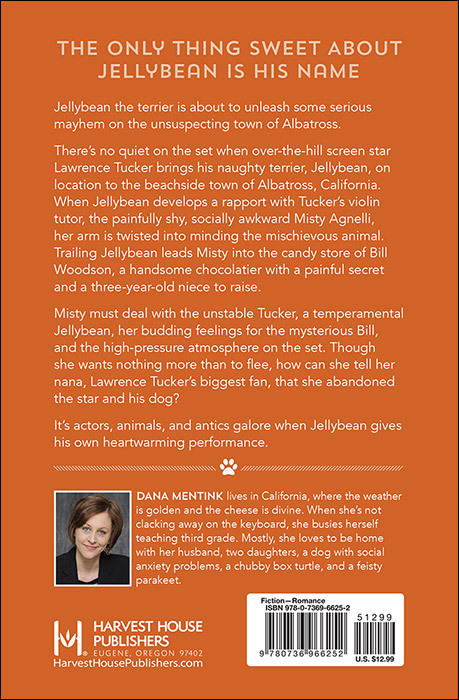 Trailing Jellybean leads Misty into the candy store of Bill Woodson, a handsome chocolatier with a painful secret and a three-year-old niece to raise. Dana Mentink is a multi-published, award-winning writer. When she’s not clacking away on the keyboard, she busies herself teaching third grade. Mostly, she loves to be home with her husband, two daughters, a rascally rescued terrier, a chubby box turtle, and a feisty parakeet. "John Steinbeck once said, 'I've seen a look in dogs' eyes, a quickly vanishing look of amazed contempt, and I am convinced that basically dogs think humans are nuts.' 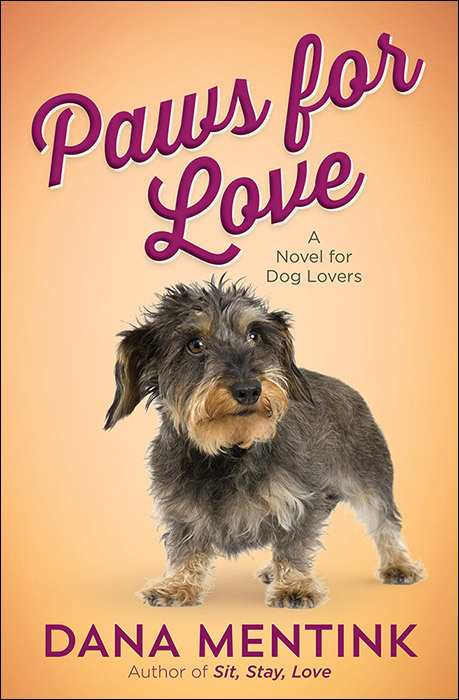 In Paws for Love, a story of mayhem and merriment, Jellybean the dog manages to outwit the surrounding humans at every turn. While he is unapologetically naughty and generally unmanageable, Jellybean helps his counterparts learn the most important lesson of all; that unconditional love can overcome the greatest life obstacles. Jellybean was modeled after my own naughty terrier/doxie mix, Junie. While Junie will never be a highly trained working dog, she has reminded us here at Mentink Manor that life holds a boundless quantity of joy, if only we will allow ourselves to seize it, and that a dog's love has nothing to do with merit. Further, both Junie and Jellybean would agree that there is always time for a treat, a nap in the sunshine, and that unsupervised socks are an irresistible invitation. "Steinbeck also said, 'Years ago, when my red setter chewed up the manuscript of Of Mice and Men, I said at the time that the dog must have been an excellent literary critic.' I have no doubt both Jellybean and Junie would happily shred the completed manuscript for this novel in a heartbeat. Canine critics aside, I hope you will enjoy your time in Albatross with Jellybean and his cohorts." "Two-time Carol Award winner Mentink's third book in this canine series is a sweet and funny delight that will amuse dog lovers and readers who are seeking a lighthearted, feel-good story." I love Dana’s work and I know that you will love this book. This story is well written, humorous, and full of adventure. I laughed so hard and it was almost impossible to put down. Get your copy right away. A hilarious journey of the escapades of this lovable terrier and the people he comes in contact with. God had a plan and He used this small dog to turn the lives of these characters around. God has a plan for you too. Just surrender you heart to Him and watch Him turn your life around too. Jellybean is fun, crazy, and simply irresistible! He steals the show in this book by Dana Mentink. Paws for Love is a fast-paced very enjoyable book! I have really enjoyed reading the entire series. Dana Mentink is an exceptional author! She really brings the character to life. At some points in the book, you will be laughing out loud with the characters and at other times you will notice a tear sliding down your cheek as you read more about them. I definitely recommend reading this book; it will be one that you will reread again and again! Jellybean will be sure to capture your heart with his paws from the very beginning.